BEST RAW ORGANIC : ) | The PERFECT BLENDER SMOOTHIE DRINK RECIPE - How To Live Best, Raw, Organic, Simply, Well! NOTE: Please click HERE for an updated best GREEN SMOOTHIE RECIPE. 1. If using non-organic, peel carrots, wash and rinse apple and greens thoroughly. 2. If using organic, simply wash carrots, no peeling necessary. 3. Pour water into blender. 4. If using icecubes, add them last, on top of veggies and fruit to weigh them down. 5. Add orange and banana to blender first. Cut up apple into 1/2 cubes. Add. Cut up carrots into 1/2 pieces. 6. Blend. Add greens last. Blend until smooth to your satisfaction. IMPORTANT: Drink BEFORE meals, preferably on an EMPTY stomach. Always be sure to INCLUDE 1 APPLE for every drink. Keep your blendie drink SIMPLE. Do not add too many different things. The easier and more basic the drink, the easier for the body to absorb. Dr. Max Gerson discovered that certain vegetables and fruits caused more problems that benefits for his patients. Therefore we do not recommend ALL fruits and vegetables. Below is a list of only the recommended best variations. These fruits and vegetables are either too high in sodium or can cause adverse reactions to the body. Why blend instead of juice? Blending is done in a blender. Juicing is done is a juicer. Blended drinks contain fiber and pulp. Juices contain little fiber and pulp. First of all, juicing is great when someone is ill and requires high nutrition with the least digestion. 1. 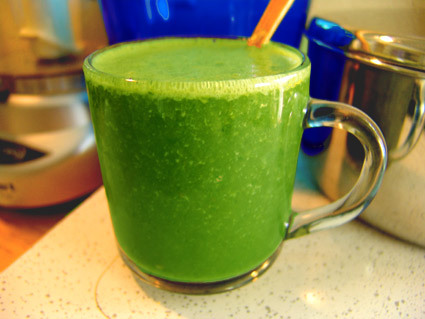 Blended drinks contain valuable fiber and pulp. 2. Blended drinks are ECONOMICAL. The peelings and pulp contain valuable nutrition. 3. Blended drinks help satiate the appetite. You feel fuller and more satisfied. Happy Blending! See our article on the best, cheapest blenders. We have additional blender recipes, as well.